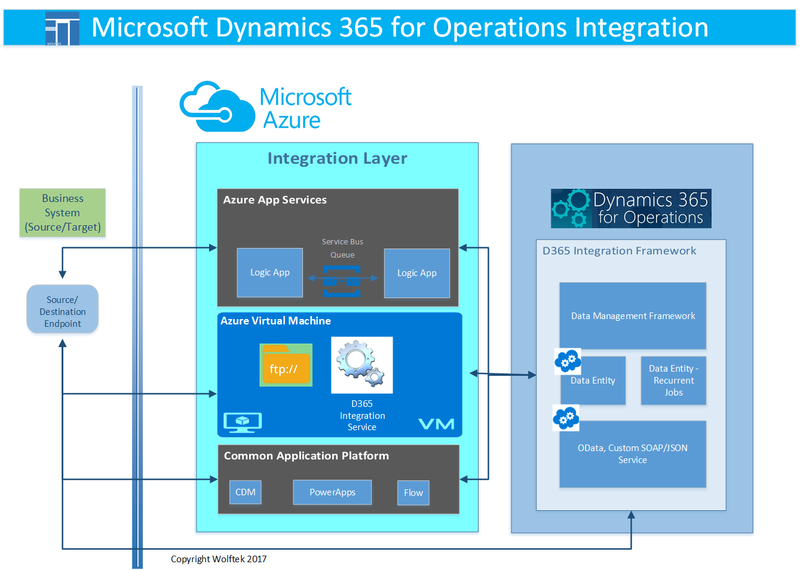 With the release of D365, the Systems Integration landscape has drastically changed. The AIF and the DIXF frameworks have been consolidated into the Data Management framework, complemented by the OData services and the Custom JSON and SOAP services. And while the synchronous integration patterns remain very closely resembling their counterparts in the previous AX versions, the asynchronous implementation is a night and day compared to the previous versions. It is no longer possible to just drop a file into a network share and configure AX to import it - either with AIF or DIXF, as the IT departments have grown used to be doing. With D365 some level of middleware, and a good share of a technical know-how is required to implement the asynchronous integrations. At Wolftek we have successfully adapted to these significant changes in the technology and are pleased to offer our customers the expertise needed to implement the various integration patterns. We are skilled and experienced with various integration approaches with D365, and are able to provide the right architecture for our customers' needs - be it an on premise-to-cloud, cloud-to-cloud implementation; and anything in between.